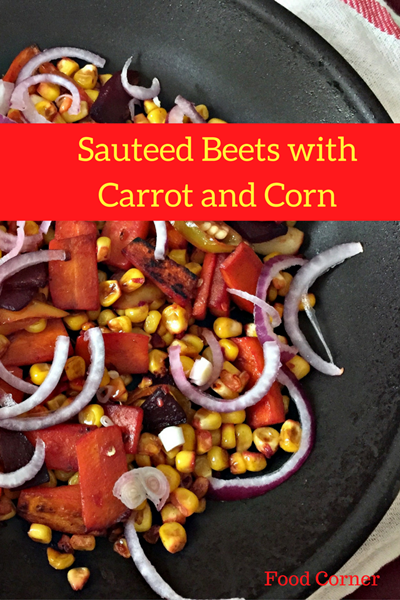 This sauteed beets recipe is really simple and easy to cook. All you need are a skillet, beets and other ingredients for adding flavour. 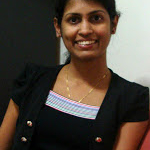 During the weekend, I wanted to cook something easy and healthy to enjoy with a light meal. I had some beets and carrots in the fridge. So, I decided to make a dish with sautéed beets and carrots over a skillet. Then I saw a sweet corn from last week which I couldn’t cook for the kid. I know corns are best when it is cooked over a skillet. 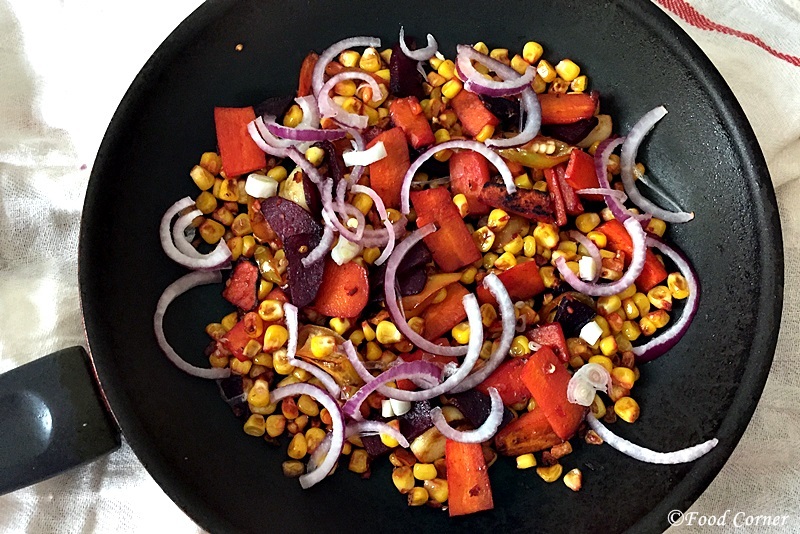 So, the corn kernels too included in our sautéed beets and carrot dish. I usually like quick cooking methods than spending more time in the kitchen. This is why I like pan sautéed or pan roasted recipes than oven baked recipes. For my skillet cooking I use both non-stick pans and cast iron skillets. I like cast iron skillet due to its ability of heating up quickly. However I found that my cast iron skillet has some signs of scratches. According to KitchenVoice , it is difficult to maintain cast iron cookware for a longer period. To maintain the non-stick surface of the cast iron cook ware, it is necessary to well season with oil before cooking over the pan. Well, cast iron skillets are bit expensive. So the scratches on my skillet didn’t make me happy. But, I learned the lesson of seasoning well before cooking over it in order to expand the life of my skillet. With that lesson learned, I started coking this quick Beet Sautee expecting to enjoy a flavourful salad with mix of tastes .It came out delicious and colourful. 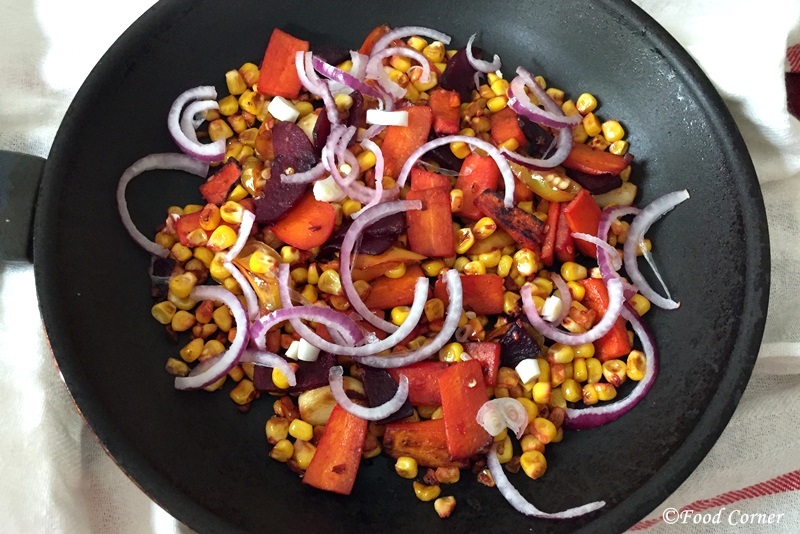 Here is the recipe for easy and quick sauteed beets with carrot and Corn over skillet. 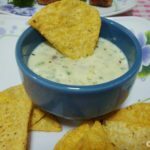 Hope you will enjoy making this dish in a relaxing evening or in a weekend. 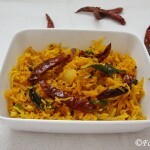 Prepare all ingredients by washing and slicing carrot, beet, onion and green chilli. Get ready with a cup of corn kernels. Heat oil in a skillet. Use medium-high heat to heat oil. When oil is hot cook ½ of the onion and green chilly until it begin to brown. Then add beet and carrot to the skillet. Cook till the carrot and beet started to change the colour. At this stage, add corn kernels and cook over high heat till the ingredients start turning brown. Stir occasionally and turn sides of beet and carrot. Add salt and black peer as per taste. Garnish and serve the salad. I used some raw onion slices over the salad to garnish it. If you try this recipe, please let me know the outcome. 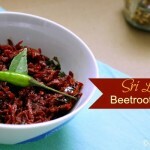 Also check this beetroot curry if you look for more beet recipes. 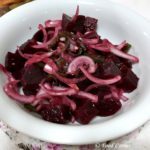 If you like pan roasted salad recipes, then check this baby carrots and purple cabbage salad recipe. I’m obsessed with beets so this is a great quick-fix meal for me when I’m working from home and need to grab something. Shall be saving this – thanks! This looks so savory! This would be the perfect recipe to make for dinner tomorrow. Can’t wait to give it a try. Thanks for sharing. yes,with beet I am sure we can mix many other vegetables including sweet potatoes. This looks so good! I can definitely see myself making this – I’m on a health kick this year so this would fit well into my diet. Thanks for sharing! I love beets, very healthy and nutritious. 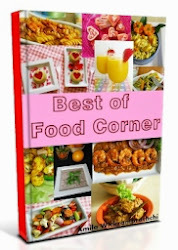 I will surely try out this recipe, looks really tasty! This looks soo good, I never had beets, so this would be an interesting recipe for me to try. Thanks for sharing. 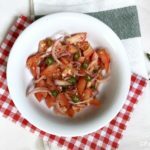 This is so healthy I must try it! I love the veggies you used and incorporated into this dish. I have been wanting to find a new dinner or lunch recipe for beets. I love trying vegetarian recipes. 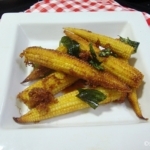 And the ones having corns as main ingredient turn out to be my favourite. I’m certainly preparing it soon. Thanks for sharing.